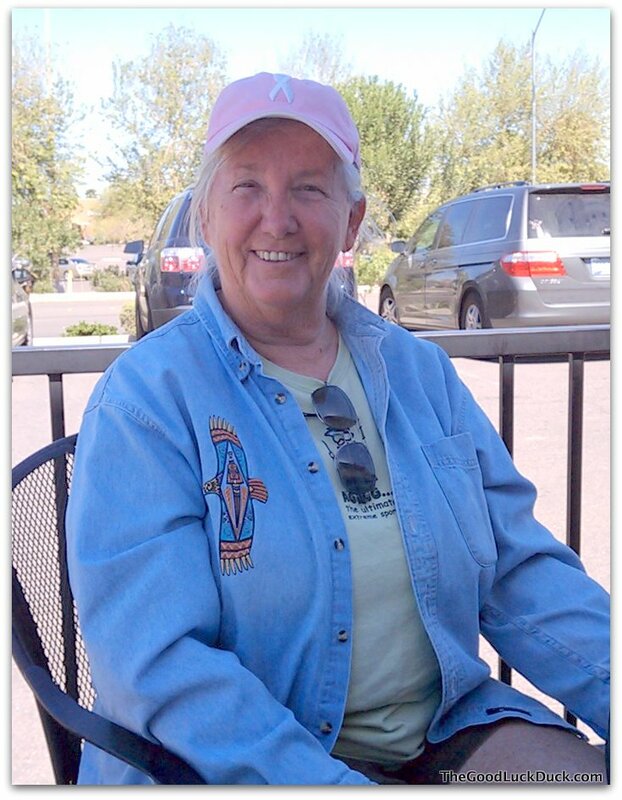 I (Annie) traveled from Tucson to Yuma for a quick overnight trip to have a filling replaced in Los Algodones. Or so I thought. Four days later, I was headed back home with 2 new crowns and a filling. I chose Sani-Dental based on online reviews. They do a huge amount of business but are very organized and efficient. I spent parts of three days there and was treated well. I feel like I received quality care and man, you just can't beat the prices. Full x-rays, two crowns and a filling all for $360, and the work is guaranteed for 2 years. For perspective, a single crown back in NY after my insurance covered its part was over $400 out of pocket. Insanity. My dentist, Esteban, was very nice but didn't speak much English so his assistant translated for him. Through her, he told me that if my hair were still black that I'd look seventeen. Mind you, this was when I was laying back in the dentist chair so that all of my wrinkles were smoothed out. Lord help us all if I were leaning forward facing down. He'd be all, "Grandma! You still have your teeth?" Let me tell you about Antonio, my street vendor boyfriend. My guess is that he does well because he's an excellent read of his clientele, and a real sweetheart to boot. He recognized quickly that I was not a woman who likes a lot of jewelry myself but that I might have someone waiting back home who's a fan. He helped me find some most excellent presents for Roxanne, then he hugged me. Twice. The next day he saw me, he picked out all of his inventory that was similar to what I bought the first day. As we haggled, I told him I was going to give him free advertising on the blog and couldn't he give me a break and he replied that he was giving me a good deal on the merchandise and couldn't I give him a tip. Sigh, our first fight. 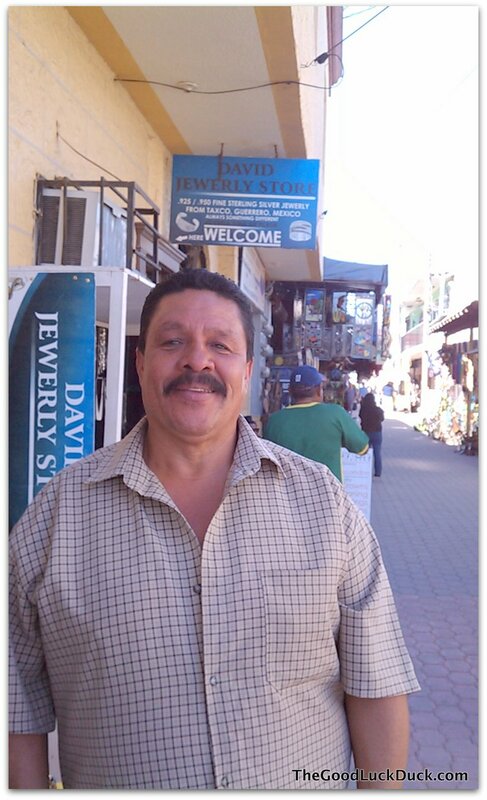 If you're in Los Algodones and looking for some jewelry, stop in to see my guy Antonio at the corner of 2nd and "B" streets. He really is a very sweet man plus he gives great hugs. Monday afternoon, I stood in line for two hours waiting to get back across the border. Behind me were three teenaged girls. Man, talk about getting attention, the jewelry vendors were all over them. But the best was when one of the vendors who makes cloth bracelets with your name sewn in offered a free bracelet to one of the girls … in exchange for a kiss. I'm all, "I'll take that offer!" Unrelated: Some Mexican men can run really fast. Also unrelated: some Mexican men need to talk to the dentist who thinks middle aged women look seventeen. A woman waiting in the border line near me had bought one of those huge plaster tortoises and lugged it from resting place to resting place as the line moved forward. For 2 hours she lugged it through the line. Finally, we'd made it through the turnstiles and were about to enter the building to show our passports when CRASH! Tortoise bits all over. The crowd gave a collective gasp. Her husband asked what happened. "I dropped my turtle!" He replied, "I didn't like the damned thing anyway." That was Mexico but the highlight of the trip was absolutely meeting up with Su! 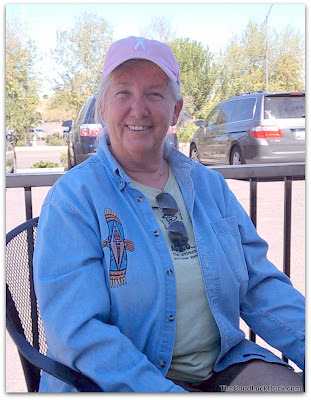 We used to belong to the same RVing email list and I'm so glad I wrote to tell her I was in Yuma. She is an absolute gem and we had a blast. I can't tell you unless you've experienced it for yourself how wonderful it is to meet up with a kindred spirit and know you've got a lifelong friend. Su took me sightseeing just across the border into California where there's a little known section of desert devoted to memorials. 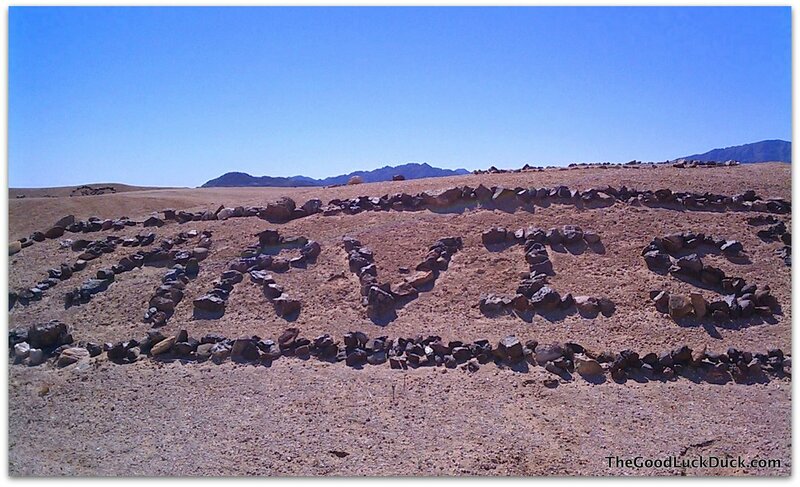 People use the area rocks to write out names and dates and stuff. It's really a huge area, I can't remember if Su said it was 2 or 5 miles long but these rock memorials are just all over out there and some are decades old. It's really a very cool and touching place. A few days after I got back to Tucson I realized that one of my crowns was a bit too tall and needed to be adjusted so I called Sani Dental and they had an opening the next day so on Friday I drove back for an afternoon appointment and stayed overnight to have that done. The best part about that, of course, was that I got to spend more time hanging out with Su. 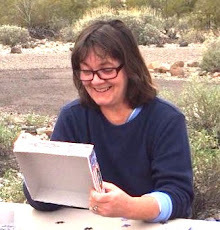 We picked up dinner Friday evening at Chipotle and took it to a park along the Colorado river and hung out there until the sun was setting, then I went to her house on Saturday morning for breakfast followed by an awesome Polaris Ranger ride in the desert. There are no pictures because I was having too much fun, and because I left my camera at home. So glad you had a good dental experience in Los A. Based on our own experience we will probably make it an annual stopover for cleanings ourselves! What an adventure - even if you did have to see a dentist!! Glad they got you all fixed up. Antonio looks very huggable ♥. Lisa, I absolutely would recommend Sani Dental, and there are others there that also get terrific reviews. I think you can get your teeth cleaned for around $30. John, with a personality to match. Donna, you should go there and try it, I'm sure Russ wouldn't mind. Maybe Antonio would give him a hug, too. Glad you had a goode xperinece Annie! We are huge fan of dental work across the border. Karin had X-rays, cleaning, one extraction, antibiotics and pain pills all for $120. And she was in and out way faster than it ever takes in the states. And she never felt like the quality of care was any lower, maybe even better. We also enjoy the always entertaining salesmanship exhibited by the locals. I really wish Americans would get their giant sticks out of their asses and not be so stupidly terrified of Mexico. It's like any crowded urban, touristy spot. Just use your head, stay aware and smile! Next winter I may need to go visit your dentist. Have serious lower jaw work needed. These ol' teeth are just too old. 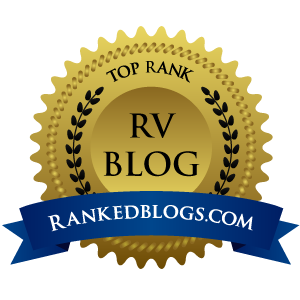 I've been eagerly awaiting a post about your trip south of the border. Glad it was a success. I like Antonio already! Brenda, Glad to hear Karin had a good experience, too. I agree with you. I felt the care I got was every bit as good as I would have in the states and I got in much quicker. The vendors were all fine, some like Antonio work harder than others but they're all nice. The only obnoxious person I saw was an American in the border crossing line making fun of and mimicking the vendors. Loudly. He was the only jerk. Swankie, you're in luck, if they can't fix your teeth you can get all new ones! Kim, thanks! It was a good trip. Antonio is a sweetie. It is totally cool when you have a friend, don't see him/her in ages and ages, but when you get back together, you pick up just where you left off. I am happy you met up with Su, once again. Thanks Nan, I hope it's not ages and ages before we get to hang out again. So glad you had a good experience in Los Algodones...I know that unless I can't make the drive, I see no reason to go anywhere else for dentistry. It's just the best! 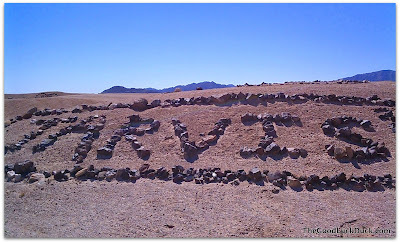 Love the "name shrine"...I'll have to try and find that next time we go to Yuma. Nina, indeed, I'll definitely go back there again. I don't know if I could find the shrine again without assistance. I just know it's not too far on the California side. Another fan of dental work across the border. I recently got a partial plate made in Nuevo Progreso across from Mercedes TX. Great work, good price. I was at first apprehensive but no complaints. We will be back in area next Jan and back I'll go for cleaning, etc. Hmmmm was Roxanne suspicious about the jewelry and Antonio....guilt gifts? LOL Definitely sounds like you had a better time going to the dentist than most of us do. I mean you got to spend the night. You're welcome, Linda. He's a cutie, isn't he? Ruth, what an awesome price! It's around $30, I think, in Los Algodones and that's a real bargain. Phyllis, glad you had a good experience with Mexican dentistry, too. I can't imagine going back to a US dentist now. Wow - I can't wait to get there and get some work done too. I keep hearing about it but glad to have your final word on it. Sounds like a lot of fun too. Who knew? I am SO enlightened now. Thanks Annie! Sure sounds like a great deal on dental work. Jennifer, I think you'd like it, the dentist and the town. I can't even think of an American city to compare it with. Marianne, glad to be of service! WOw, I'd love to visit Los Algodones someday. It looks like a great place. I'm glad you found a great dentist too. It sounds like he does a great job with the language barrier too.